View of eastern Faial ovelooking the beach of Praia do Almoxarife and Pedro Miguel parish in the distance. Faial is a lovely, picturesque island with rolling green pastures, lots of cows, and hedgerows filled with hydrangeas and other colourful blooms. It is reminiscent of the English county of Devon in parts except that the hills and coastal cliffs are higher. Oh, and there are volcanoes! 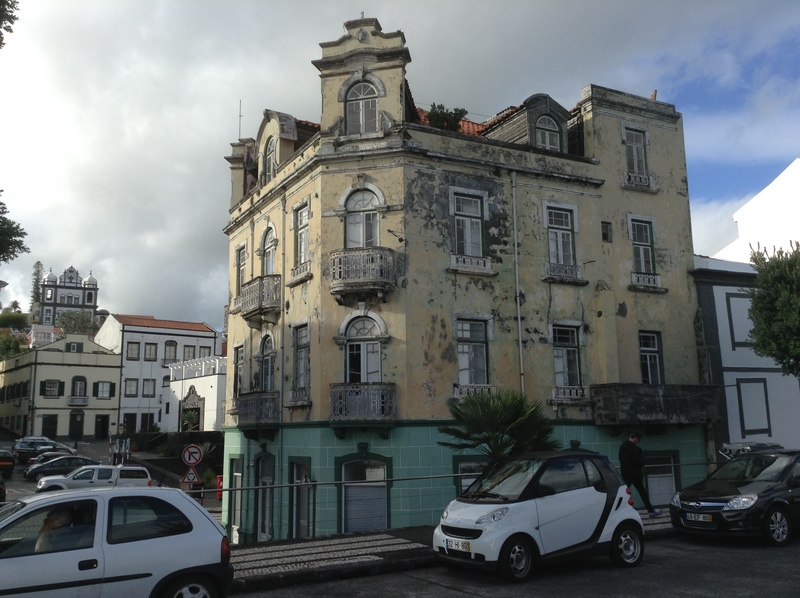 An elegant building in Horta in need of a new coat of paint. The charming main town of Horta is as pretty as a postcard with a surprising number of significant buildings and churches considering that it only has 10,000 inhabitants. Pousada Forte da Horte. Not many hotels come with their own portcullis! 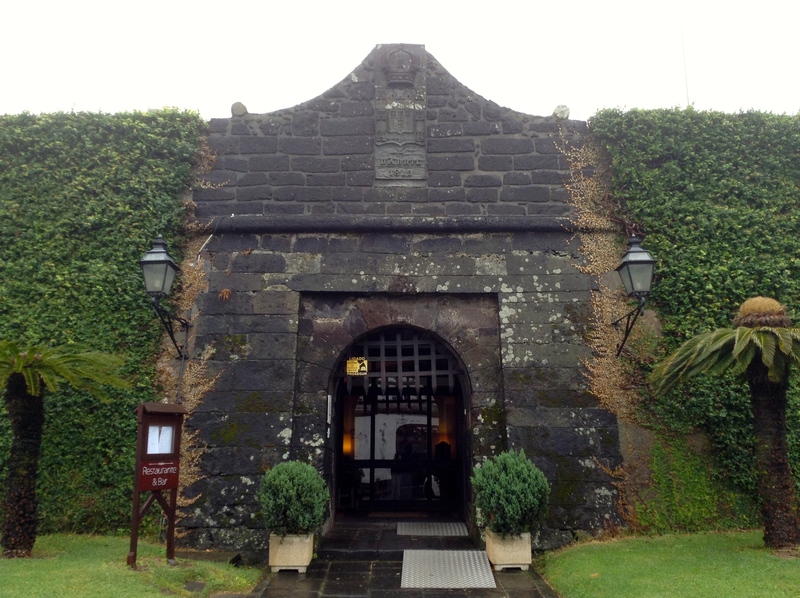 We stayed in the historic Pousada Forte da Horta hotel which is housed in the 16th century Fort of Santa Cruz on the harbour front with spectacular views of neighbouring Pico Island. 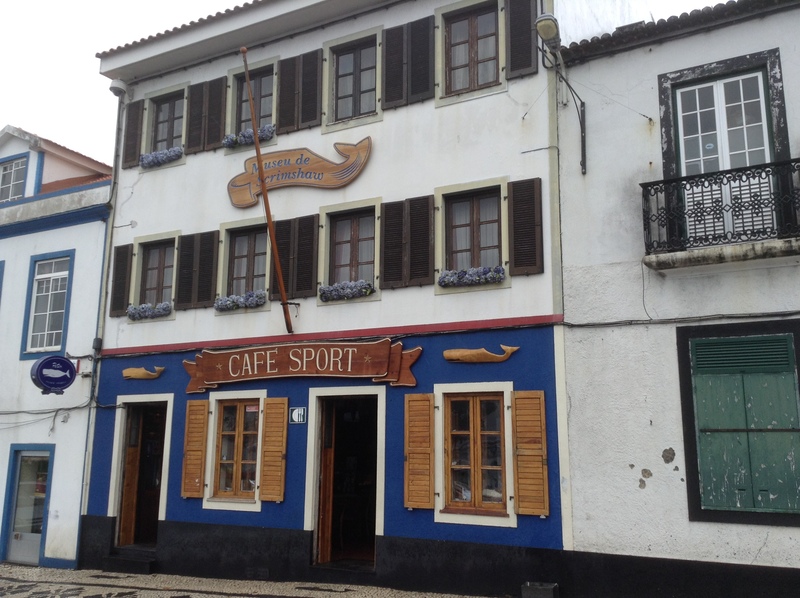 Café Sport, also known as Peter Café, is famed among the transatlantic yachting community as the best place in mid-Atlantic to eat, drink and be merry. Actually in November it is one of only half a dozen places open in Horta which pretty much shuts down for the winter. Above the bar is the Scrimshaw Museum, scrimshaw being the art of engraving pictures on ivory or bone, formerly popular among sailors. In the Azores, scrimshaw is traditionally carved on whales’ teeth which used to be common in the days when Faial was a commercial whaling centre. Since whaling was banned in 1986, whales’ teeth have become as rare as hens’ teeth. View of Horta from Monte Guia. After a bracing walk you can return to Horta town via Porto Pim beach and perhaps enjoy a very fine sangria on the terrace of the Taberna Pim restaurant while watching the waves break against the harbour wall. 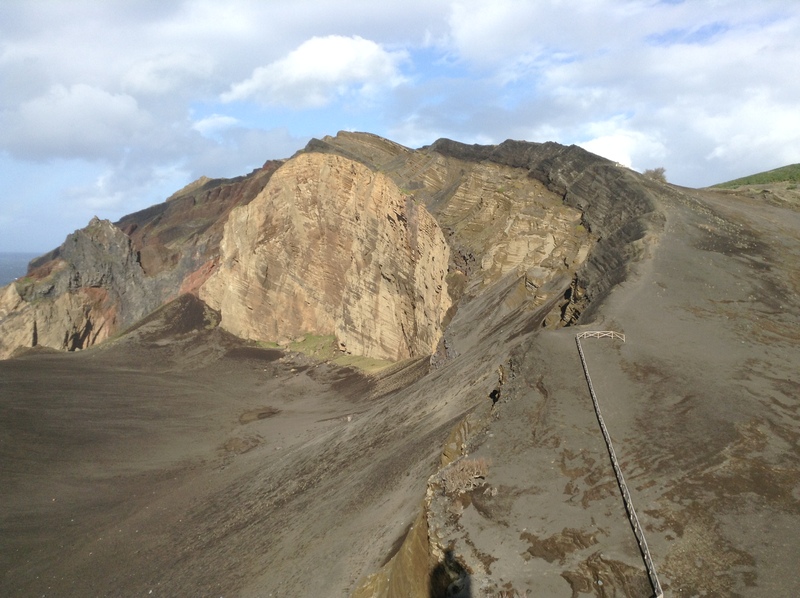 Visitors to Horta don’t have to go far to see a volcanic caldera as there is the remnant of one jutting out into the ocean just on the edge of town. There is a nice trail skirting the caldera, known as Monte da Guia, providing great views of the town. There is an aquarium here where rare fish are bred for supply to major aquaria around the world. 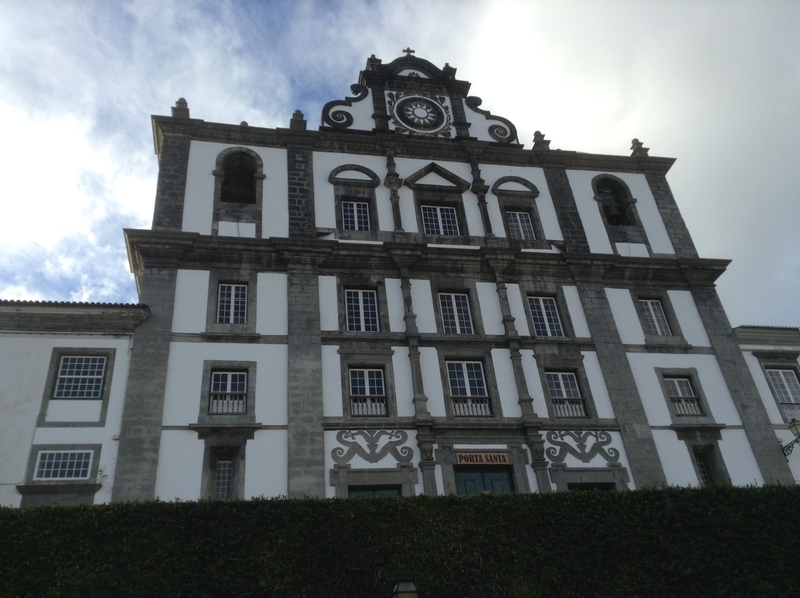 There is also a former whaling station (closed during my visit) and a small museum called Casa dos Dabney which was the beach house of a prominent American family who lived in the Azores during the 16th and 17th centuries. Horta Museum is located in this building. Interesting that the sun emblem is identical to that appearing on the Taiwan flag. Did Kuomintang borrow their party flag from the Portuguese who were the first Europeans to reach Taiwan and named it Formosa? In the town there is the Horta Museum and a number of grand churches and civic buildings to admire and a handful of restaurants and cafes. Shopping is limited with only one medium sized supermarket and a number of small family owned shops. There are none of the international high street brands and almost no tourist tat which, in my view, adds to the charm of the place. It was way too cold and windy for us to attempt hiking round the crater rim. Proper clothing required! 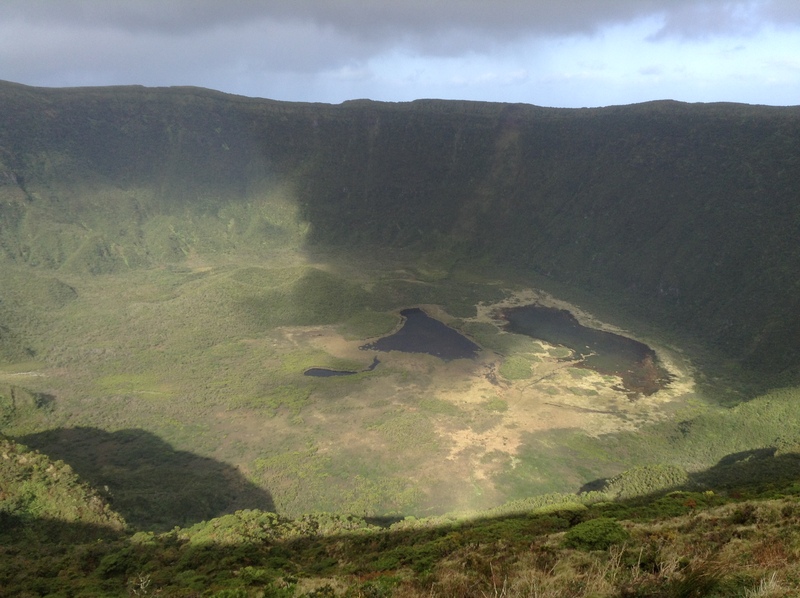 In the centre of Faial is the island’s highest point, Cabeço Gordo, at just over 1,000 m. Here too is a massive caldera, two km wide and 400 metres deep. You can drive right up to the rim from where there is a hiking trail all the way round the rim of the crater. Descent into the caldera is not permitted. 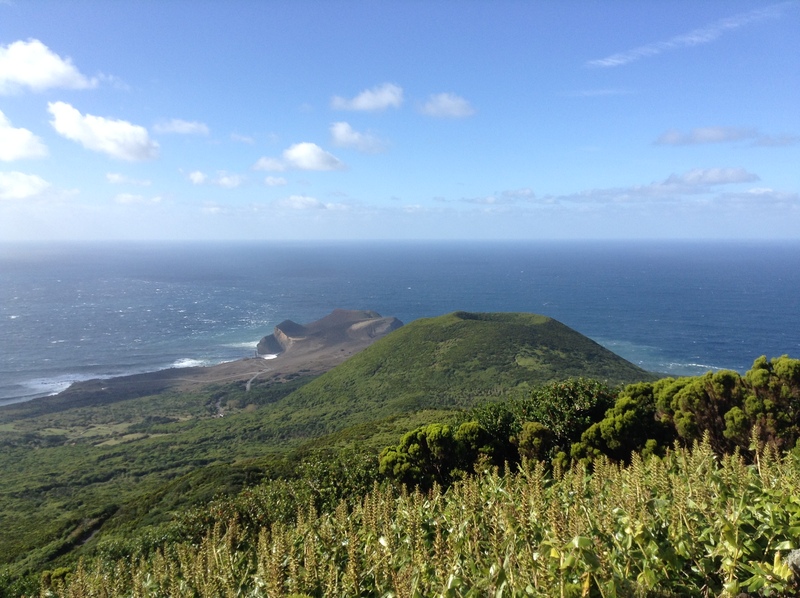 For the super keen hiker there is a coast to coast east/west hike of 36 km which cuts right across the centre of the island and includes the caldera rim hike. According to the information board this hike should take 12 hours. Next time perhaps! View from Cabeço Verde looking towards Capelinhos Lighthouse. 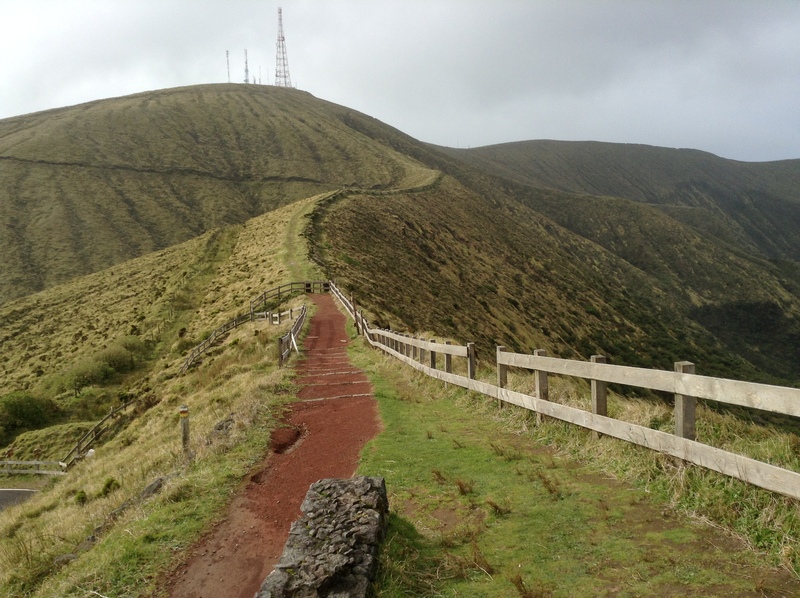 A shorter and easier hike covers some of the volcanic cones of the Capelo area on the west of the island. 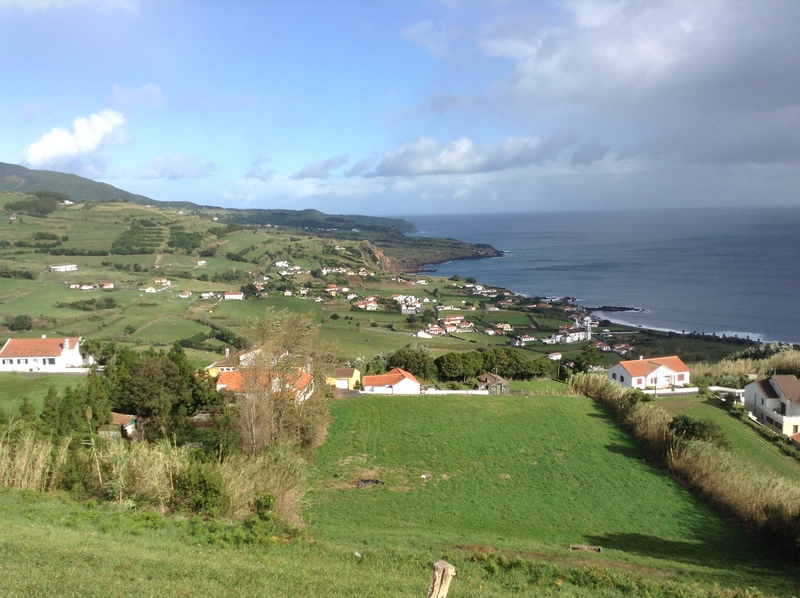 It starts at Cabeço Verde from where there is a spectacular view over the entire western half of the island. This part of the earth’s surface is younger than me! The view from the top of Capelinhos Lighthouse showing Capelinhos Volcano, formed in 1957. At the westernmost point of Faial is the Ponta Dos Capelinhos Lighthouse which used to stand on the shoreline until 1957 when a volcano suddenly rose from the ocean, spewing rocks and ash over the area and effectively added a couple of square kilometres of new land to the island. The lighthouse still stands surrounded by volcanic ash. An underground museum known as the Interpretation Centre of the Capelinhos Volcano has been built here with EU money. Ponta da Ribeirinha Lighthouse, destroyed in an earthquake in 1998. 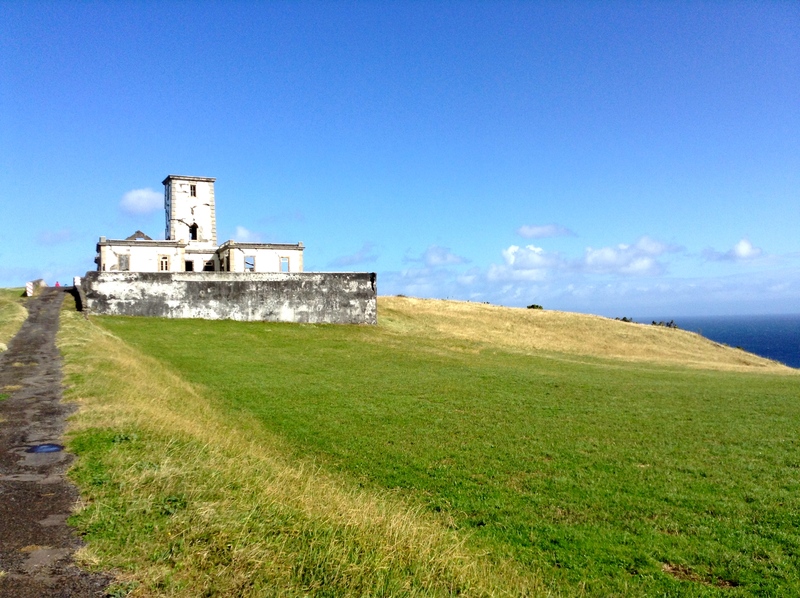 At the eastern extreme of Faial are the remains of another lighthouse, Ponta da Ribeirinha, which was ruined by an earthquake in 1998. As you can gather, Faial is a hotspot of seismic and volcanic activity which is worth bearing in mind if you are planning to buy a retirement home here. 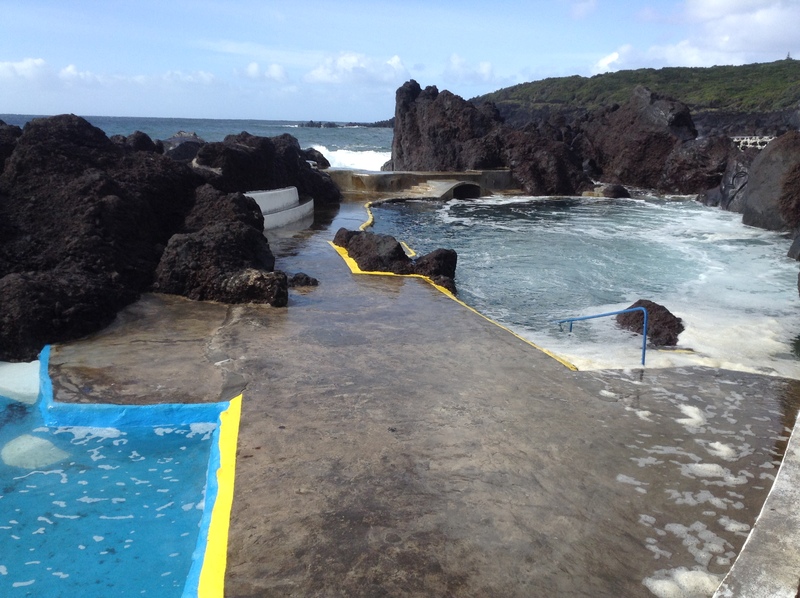 Natural (apart from the concrete) bathing pool at Varadouro. Even in November the sea temperature is quite mild but rough seas can make some of these pools unsafe. There are a couple of good beaches on the island, the best of which is probably Praia do Almoxarife (black sand) but there are also a number of rocky inlets where pools, naturally replenished and washed by crashing waves, provide sheltered bathing during the summer months. Graffiti covered breakwater at Horta Marina. In the background is Mt. Pico on neighbouring Pico Island capped with an unusual lenticular cloud. Back in town, Horta Marina is a pleasant place for an amble. 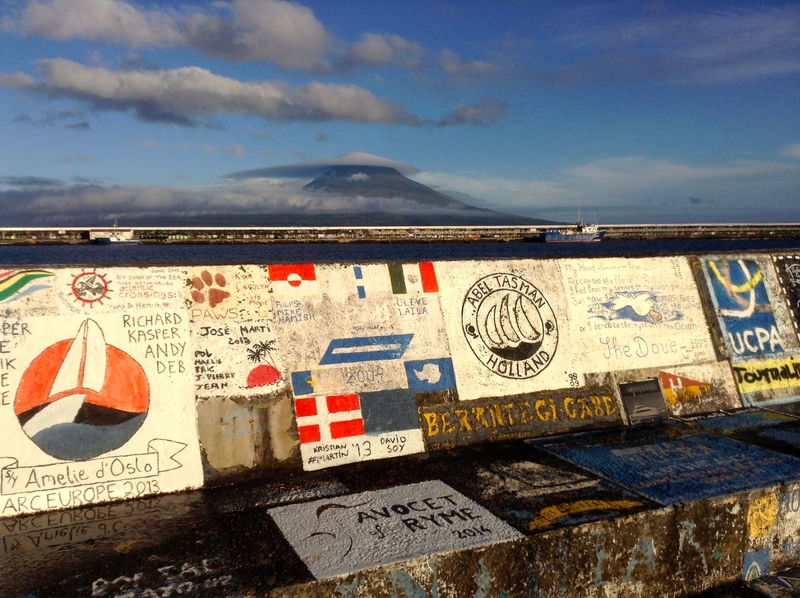 The breakwater is covered in graffiti – nautical murals painted mainly by long distance yachtsmen. It has become tradition for cross-atlantic mariners to leave their mark here as a commemoration and for good luck in the remainder of their voyage. 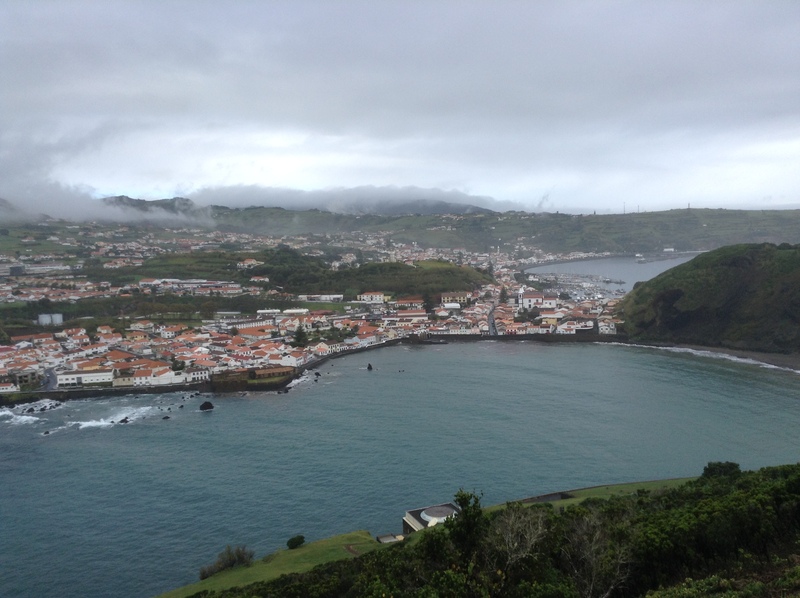 Hope this gives you a flavour of Faial Island. 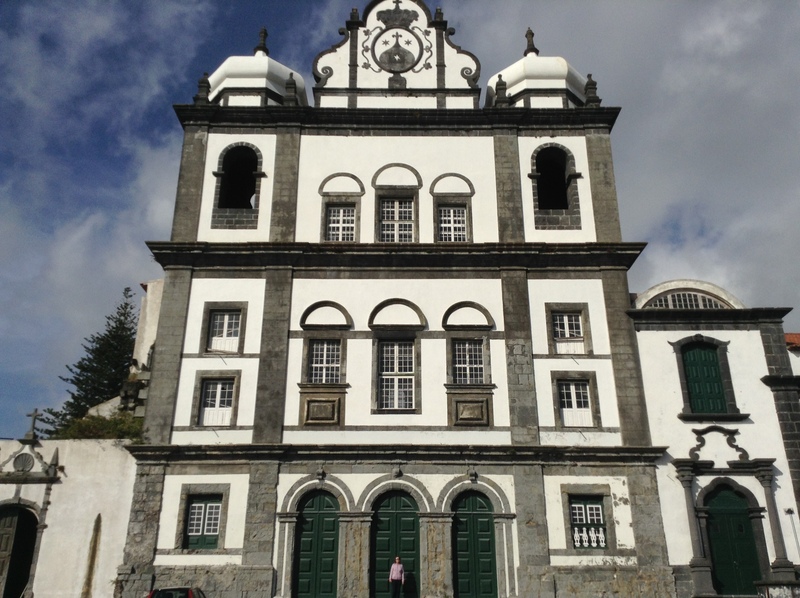 In my next Azores blog I’ll post something about Pico Island. Fraser's Hill or Cameron Highlands? Ipoh – Heritage Walk. Part 1. Los Angeles to New York: By Air, Train or Bus. North Borneo – What a Way to Run a Country! Redang Island – What's Killing the Fish?